FINALLY, a filter media that provides DE-like water clarity for your sand filter! Yes, Zeobest, a safe, naturally occurring, environmentally friendly zeolite filter media, provides DE-like water clarity in sand filters. Our uniform three-dimensional honeycomb structure filters down to 3 – 5 microns just like DE. Zeobest out performs pool filter sand because our surface area is thousands of times greater. But don’t be fooled! NOT ALL ZEOLITE FILTER MEDIA WERE CREATED EQUALLY!! Compare Zeobest to the other products on the market. Please check out Zeobest’s performance for filtration/water clarity and our ability to reduce or eliminate chloramine formation and the resulting eye irritation. Zeobest has the highest Cation Exchange Capacity (CEC) of any zeolite filter media in the US. Click on the link below to bring up our certified laboratory performance results. Choose Zeobest for superior water clarity, safety and to eliminate eye irritation caused by chlorine and chloramine formation. Also, consider moving up to Zeobest Ultra!! We combine the superior water clarity and CEC capabilities of Zeobest with our patented Sanitect technology. 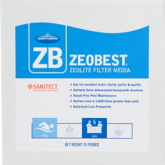 Zeobest Ultra is the first EPA Registered, antimicrobial, anti-algae filter media for sand filters. Zeobest Ultra will save you as much as 40% or more on your chemical usage per year and eliminate the frustration of operating a pool! Yes, put the FUN back into owning a pool with Zeobest Ultra! Flow rate typically: 15 – 20 gpm/sq. ft.